When iPhone wants to get your attention and tell you something, it communicates via badges and messages. These are different from alerts, alarms, and reminders that you set on your iPhone in that they contain information iPhone wants to give you. White numbers inside a red circle that appear in the corner of certain app icons, such as Mail and Facebook. The number indicates how many unread messages or status updates await you in those apps. When a new app has been installed or an existed app updated, a blue dot appears to the left of the app name under the app icon. There are also two kinds of notification messages. The first kind requires a response and appears when you want to do something but iPhone needs something else to happen before it can complete the task. These messages appear in rectangular boxes in the middle of the screen and typically display buttons you can tap to respond to with a certain action. 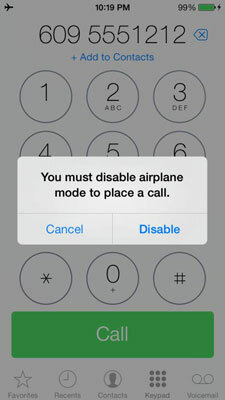 In the example, for instance, you have the choice of acknowledging the notification message by tapping Cancel, or by tapping Disable to turn off Airplane mode. The second kind of notification is when you’re doing one thing, say reading an article on a website, and another thing happens, say, you get an incoming e-mail. You see a notification banner across the top of your iPhone’s screen. You can choose to respond or ignore it. If you ignore the banner, it disappears in a few seconds. iPhone saves all your notifications in the Notification Center, which you can see by swiping down from the top of the screen. 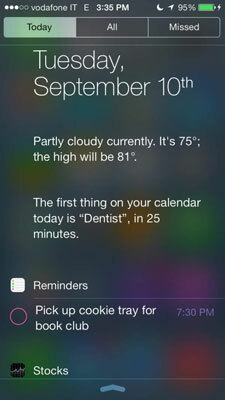 You choose which apps you want to see in the Notification Center in Settings. You also choose whether alert-generating apps display alerts, banners, badges, or none of the three.